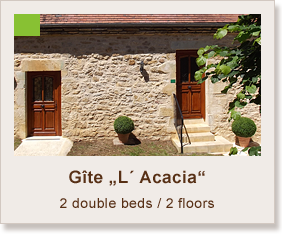 Our Gîtes "Acacia" and "Glycine"
Gîtes les Tourniers are comprised of 4 rental properties dating back to the early 19th century which have been lovingly restored to a high standard keeping old features such as oak beams and exposed honey-coloured natural stone walls and period fireplaces which now house wood burning stoves. The complex offers a shared pool with a pool house which has a changing room, toilet and walk-in shower. 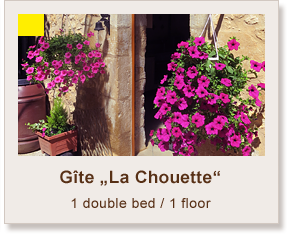 The Gîtes Les Tourniers are situated in the golden triangle of Dordogne, on a hillside above Cenac et St. Julien across the valley from Domme with stunning views of the medieval town of Domme. 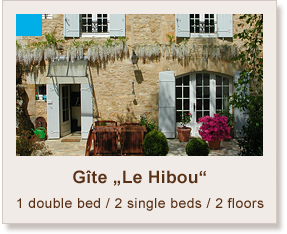 Cenac et St. Julien is the nearest village ( 2.2 Kms ) and offers bakery, butcher, supermarket, petrol station, newspaper shop, pharmacy, hair dresser, cash point, post office as well as doctor and dentist. weekly market for fresh local produce is every Tuesday. 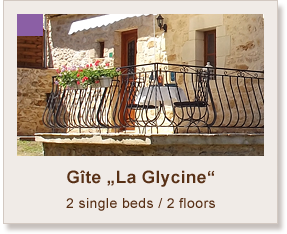 All Gîtes have open plan living, dining, well equiped kitchen, Free Sat ( Astra 1, Astra 2 ), Stereo system , Wi-Fi, wood burning stove, underfloor heating, private outside terrace with gas barbeque- The complex offers a shared pool with a pool house which has a changing room, toilet and walk-in shower. Click on pictures above for more details!